1) It takes huge areas of land and huge quantities of wood to supply a tiny fraction of the energy we use. 2) Burning biomass emits CO2 to the atmosphere, just as burning fossil fuels does. Claims that all this CO2 can be ignored are based on politics, not science. 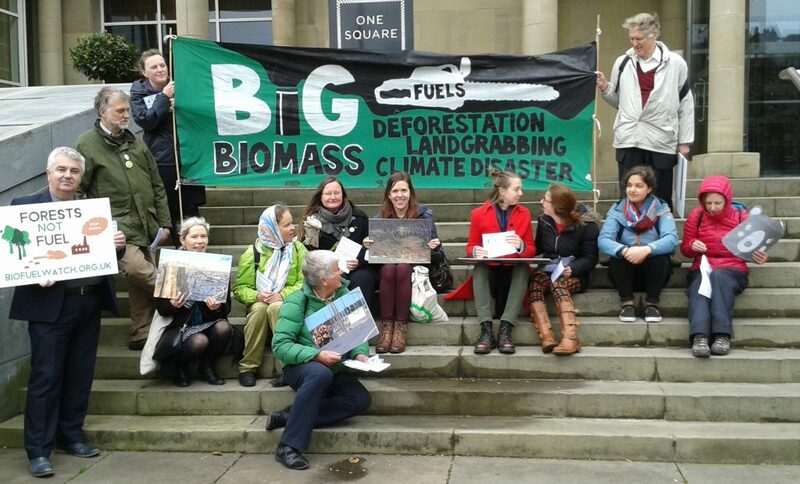 3) Burning biomass causes just as much harmful – and for some deadly – air pollution as burning coal. Even if all that wood had been burned in extremely efficient combined heat and power plants rather than in Drax power station, it would still have contributed less than 1.5% of UK energy. The reason why biomass has a huge land footprint is that plants are very inefficient at converting energy from the sun into chemical energy. Forests and other ecosystems constantly recycle carbon, nitrogen and many other nutrients. Only a small proportion of the solar radiation that falls on a leaf is used to sequester carbon in trees and soils . Even worse, the amount of energy contained in biomass that is converted to electricity in a power station is miniscule once we compare it to all the energy that goes into building a power station, maintaining and logging tree plantations, chipping wood or turning it into pellets, transporting it, and then burning it at 35% efficiency or less. Biomass electricity is the least efficient way of using land to produce (renewable) energy – by a long stretch! 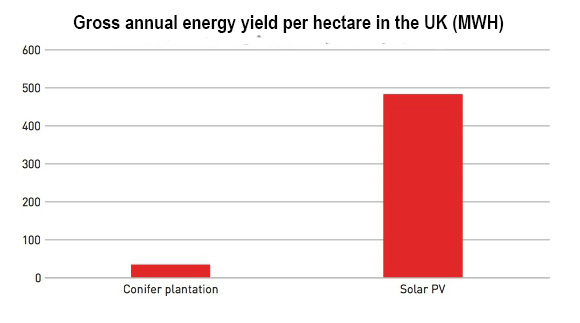 Here is a representation of the amount of energy which solar PV can generate from one hectare of land in the UK compared to the amount of energy contained in the annual growth of UK conifer plantations on one hectare. Note that the solar PV figure is very conservative and lower than what has been reported from projects in England. If one looks at the actual amount of electricity generated from biomass versus solar PV from one hectare of land, the figures are even worse for biomass. Click here for more details about the figures above and to about just how poorly wood-burning for energy compares with solar PV, even in the UK. Energy companies and pellet producers like to tell us that they are using “residues” for their woodchips and pellets – even if photos show truck after truck of whole logs entering the pellet plant or woodchip mill. In 2013, Timothy Searchinger from Princeton University calculated that, if the UK was to remove and burn all its forestry residues in power stations, those would supply a mere 0.9% of the UK’s electricity4. Because electricity accounts for just 17.5% of all the energy used in the UK5, this would translate into a mere 0.16 of total energy! And removing all residues, i.e. branches and leaves will deplete forest soils and result in them losing carbon and nutrients and in future trees growing less well. Even worse, a recent study shows that even burning US wood pellets that are made from genuine forestry residues will have a negative impact on carbon dioxide in the atmosphere for decades to come6. • Forests sequester CO2 year on year, both in wood and other vegetation, and in soils. For a forestry company, logging the equivalent of the annual growth in trees every year appears “sustainable” because the volume of wood in a plantation or forest isn’t diminished. But for the climate, this means that forests will no longer sequester any CO2 at all. At present, around 30% of all the CO2 that humans emit, mainly from burning fossil fuels, is sequestered by plants. If less CO2 is sequestered in plants, more will stay in the atmosphere, fuelling warming. • The Paris Agreement commits Governments to trying to keep global warming to within 1.5ºC, but this will be impossible to achieve without a rapid phaseout of fossil fuel burning AND more CO2 being removed from the atmosphere. There is only one proven way of removing any CO2 from the atmosphere: Allowing natural ecosystems – including healthy soils – to flourish and regenerate, and helping restore them where necessary. If we want to have any hope of stabilising the climate, we need an end to fossil fuel burning as well allowing a lot more forests and other ecosystems to grow. Cutting down forests to replace some fossil fuels is completely the wrong answer. • Storing woodchips emits significant amounts of methane, and those methane emissions are not accounted for by anybody8. 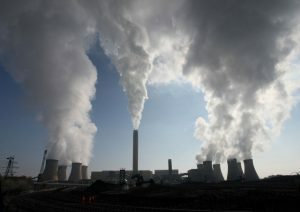 Burning wood in power stations is just as polluting as burning coal. It emits less of some pollutants (especially sulphur dioxide and mercury) but more of others (especially small particulates and Volatile Organic Compounds). Toxins emitted by biomass power plants are linked to respiratory and heart disease and strokes, and some are also linked to cancer and birth defects. Furthermore, processing wood to pellets or woodchips often emits a lot of wood dust. Communities exposed to wood dust report higher incidents of respiratory and nasal problems and, furthermore, wood dust is a known carcinogen. Click here to read our briefing about air pollution from biomass power stations. Right now, Drax is the only UK power station that burns imported wood pellets rather than domestic woodchips. In 2016, Drax burned 6.6 million tonnes of pellets (made from 13.2 million tonnes of wood). The majority of those pellets came from the southern US, with most of the remainder coming from Canada, Latvia and Estonia10. However, the mothballed Lynemouth coal power station is currently being converted to biomass and is expected to start operating later in 2018. And MGT Power (owned by Macquarie Group and the Danish pension fund PKA) is building a large new biomass power station at Tees Port which is to open in 2020. Both power stations are to burn 1.5 million tonnes of pellets annually, and both have entered into sourcing agreements with Enviva, Drax’s biggest external pellet supplier. To find out more about wood pellets and how their trade damages forest ecosystems, click here. And for more detailed info about all areas of wood-based biomass, see our biomass FAQs. Drax generated 12.7 TWh of electricity from burning wood in 2016 (drax.com/wp-content/uploads/2017/03/Drax-Group-plc-annual-report-and-accounts-2016-Smart-Energy-Solutions.pdf). The UK’s total electricity use during that year was 303.8 TWh, however electricity contributed just 17.5% of the UK’s final energy demand. (gov.uk/government/uploads/system/uploads/attachment_data/file/633029/DUKES_2017_Press_Notice.pdf). See biofuelwatch.org.uk/biomass-resources/resources-on-biomass/ for a list of relevant scientific studies and reports.